POST funding comes from the Peace Officers' Training Fund (POTF). The POTF receives money from the State Penalty Assessment Fund, which in turn receives money from penalty assessments on criminal and traffic fines. Therefore, the POST Program is funded primarily by persons who violate the laws that peace officers are trained to enforce. No tax dollars are used to fund the POST Program. Learn more at: post.ca.gov. This course was developed to help prepare California law officers to identify and respond to gang activity in their cities. Gangs: PC 186.22 for Patrol was developed to help prepare California law enforcement officers to identify and respond to gang activity in their cities. The course used a highly interactive, scenario-based approach to not only educate officers about some of the key trends and groups in California, but to bring home the importance of accurate and detailed field reporting to support gang prosecution. 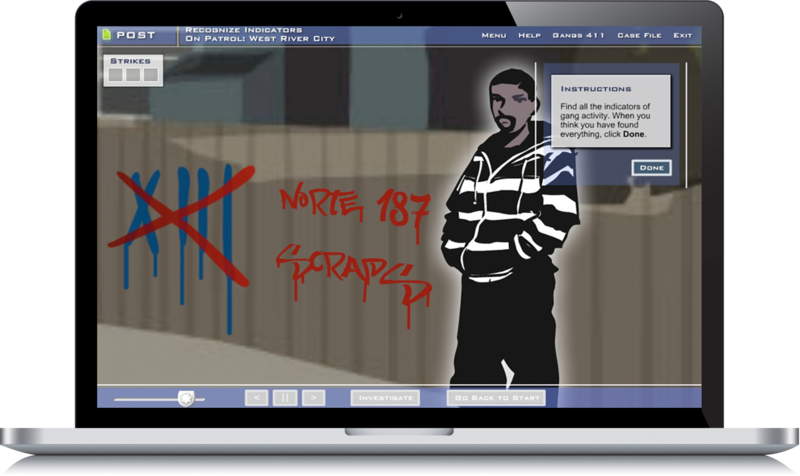 In the e-learning course, officers work through a storyline which includes neighborhood patrols, graffiti identification and challenging field interviews with gang members to gather key evidence in their case files. In the process of successfully navigating the interactive challenges, officers help the DA bring enhanced charges against the leaders of a new, emerging gang. Throughout the course, links to real-life case studies, photographs, key indicators, and other information about California gangs are provided as resources.